It has always been human nature (or so it seems) to create weapons with whatever items one can find. From hand carved arrows and arrow heads, to prison shanks, humans have always come up with a way to “Macgyver” some sort of weapon. 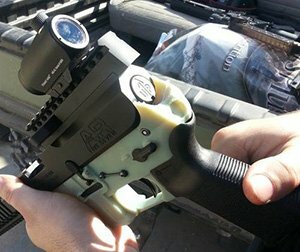 Considering that with CAD software and a 3D printer you can make just about anything that physics allows, people have predictably started to experiment with 3d Printing gun parts to be used with full functionality. Having gun parts made of 3D printed plastic is an appealing idea; however in the wrong hands the idea is as dangerous as the gun itself, and for several reasons. The strength of the 3D printed material, in general, is not durable enough to withstand the forces associated with firing a bullet, ejecting the spent shell casing, and loading a new round in a fraction of a second, repeat. The design could literally explode in the users face. Material options are getting stronger and more durable; however, the use of these materials can cost more than the actual gun itself. This leads to the next issue. Assuming that the materials were strong enough for use in a firearm, the fact that the firearm is made of plastic, presents security risks. These guns would be less likely to trigger a metal detector and anyone who would require a covert weapon such as this should be considered a threat. There are manufactured firearms available today that use nylon composites for weight reduction, however, there is still plenty of metal on the gun and the guns do not escape metal detection. Have you seen “In the Line of Fire,” starring John Malkovich and Clint Eastwood? In my business I have received several requests to create 3D printed parts to be used on a firearm, but do not actually contribute to the firing of a bullet. The parts are mainly modifications to hand grips and stocks, catered to the individual client’s design. Experimenting with firearms outside of a certified environment is deadly, especially when the materials used are questionable. The documented experiments usually result in a broken part after just a few rounds. On the other hand, just one round can kill. It is my business principle to never supply anyone with a dangerous item, and certainly not an item intended to harm a human. There are many ideas and products that do not hurt, but rather help. I choose to focus on these projects. I believe in the right to bear arms, and I am a supporter of responsible gun ownership. Considering that our government approves and regulates gun ownership, there are already many parts and accessories available. While Finnovation Product Development will work with certified manufacturers of firearms to enhance their design process, under no circumstance will Finnovation Product Development supply individuals with parts intended to circumvent established federal restrictions. This is a legal grey area, but morally I am clear about not supplying potentially harmful parts to human beings. Finnovation Product Development will never provide illegal (or grey area) gun parts to anyone. We work with certified manufacturers in these cases to ensure federal and state laws are upheld at all times.